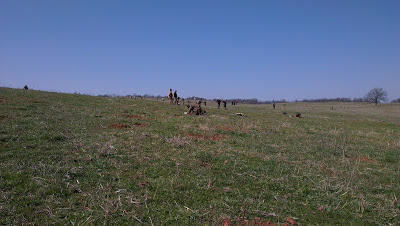 The 2013 Spring Diggin' In Virginia invitational relic hunt was held at the Spillman farm in Brandy Station, Virginia. Weather for the first two days was chilly but sunny. The second half of the third and final day of the hunt saw bitter cold and snow which sent most folks, including myself, heading for home rather than braving the harsh conditions. This says a lot about our constitution these days compared to that of the soldiers who camped, slept, fought, and died on these same lands in the early 1860's. We take for granted such seemingly simple things as synthetic materials that block the wind and shed water whereas in those days cotton, wool, leather, and a campfire were the only protection from the mercurial Northern Virginia elements. All DIV events are highly anticipated by attendees but this one was particularly so given the results of the last hunt on the property. Sixty plates were found at that DIV —a mind boggling number especially in this day and age when untouched campsites are all but extinct. This farm was apparently the location of a large cavalry camp and a large oak tree standing in the field today marks the Northern extent of the camp. Around that tree at the last hunt, an individual located seven Eagle sword belt plates lined up in a row. Were they forgotten, intentionally discarded, was the number significant? We'll never know but perhaps the old oak does. 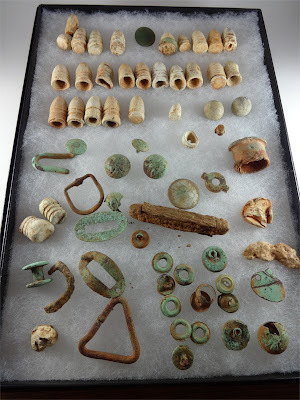 And while he's not divulging any secrets of what he saw in those days several buttons were found around the ancient trunk at this DIV as well. I always forget what it's like to hunt with 400-ish other metal detectors in close proximity so the first 45 minutes of a DIV are a bit jarring for me as I try to escape the EMI from all the other pulse-induction machines. I struck out on a path that would take me diagonally through the top quadrant of the old cavalry camp. 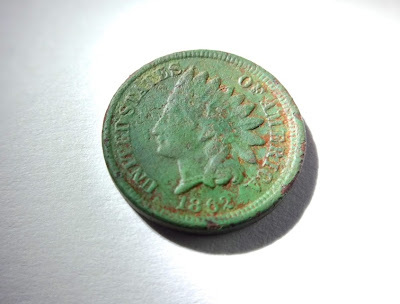 My first find was this Indian Head penny from 1862, dropped by a soldier not long after it was minted. I'm not a coin enthusiast by any measure but given that this penny was carried by a Civil War soldier, I was quite happy to start out with a good coin in good condition and let's face it, it's always good to get that first find under your belt! Interestingly, this Indian Head has the distinction of being the most shallow Civil War relic I've ever dug -- it was probably no more than half an inch below the surface of the field. I kept working my way through the plug with my pinpointer and couldn't believe how close to the surface this thing was. I almost stopped looking for the target thinking it was most likely surface trash. A few feet away from the Indian Head on the same gentle slope, I found something I'd never seen before. 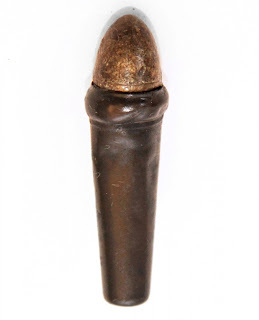 At first, I was confused — a bullet with a brass ring around it—what the heck? Finally I realized what I'd found was a partial Burnside cartridge. This unique cartridge and the breeh-loading carbine that fired it were the pre-war invention of none other than famously hirsute Ambrose Burnside. Ironically, it was the invention of the Burnside carbine that led to his promotion and President Lincoln's giving him command of so many troops. But alas, proficiency in one skill doesn't necessarily indicate talent for others as Burnside's disastrous performance during the Battle of Fredericksburg at Marye's Heights so tragically demonstrates. Over 8,000 Union troops fell as they repeatedly attacked in vain an impregnable Confederate position. 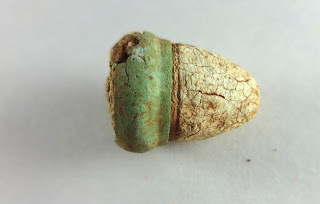 This was the first Burnside I'd ever found and, although I found one other at DIV XXIII, it had none of the brass casing left. One of the most incredible aspects of relic hunting in Virginia as opposed to North Carolina is that you encounter a much broader variety of relics that reflect a timespan of years versus weeks. Troops occupied the Raleigh area, where I live, for only a few weeks (not counting Reconstruction), and the relative homogeneity of Union relics found here, reflects that. Not so in Virginia where troops lived and fought for four years and there's a seemingly endless variety of bullets to be found. 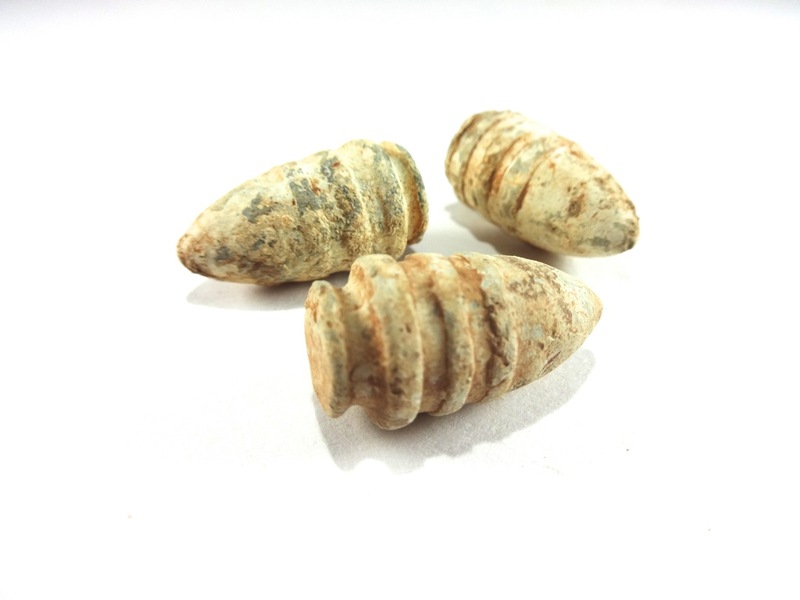 One of the more distinctive bullet types I found on this particular hunt was a Ringtail Sharps. Both Northern and Southern troops used this ammunition early in the war but eventually the Union replaced it with a different variety. 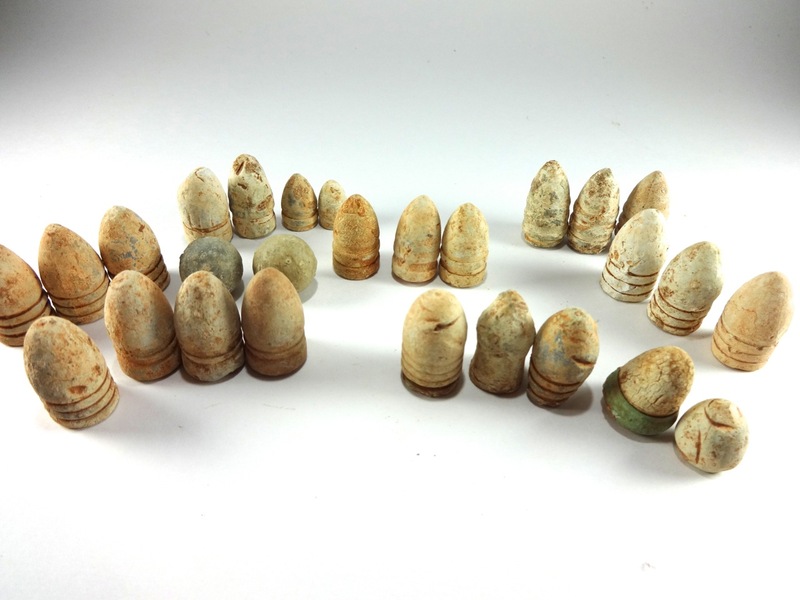 I found several Ringtail Sharps bullets in an area where, as I later learned, others had found South Carolina troop buttons and a Confederate Reed artillery shell. So it's probable that these Ringtails were dropped by Southern troops. Reinforcing that notion, a few yards from where I found the Ringtail Sharps bullets, I also found several Gardner bullets which are certainly Confederate. 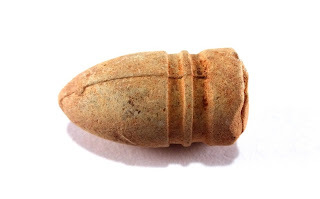 All of my ancestors on both sides of the family fought for the South and some were even at Brandy Station so it's always interesting for me to see one of these bullets come out of the ground. It also makes me grateful to have been born in the 1960's instead of the 1860's! And now I'll relate one of the more comical aspects of my DIV XXIII experience. 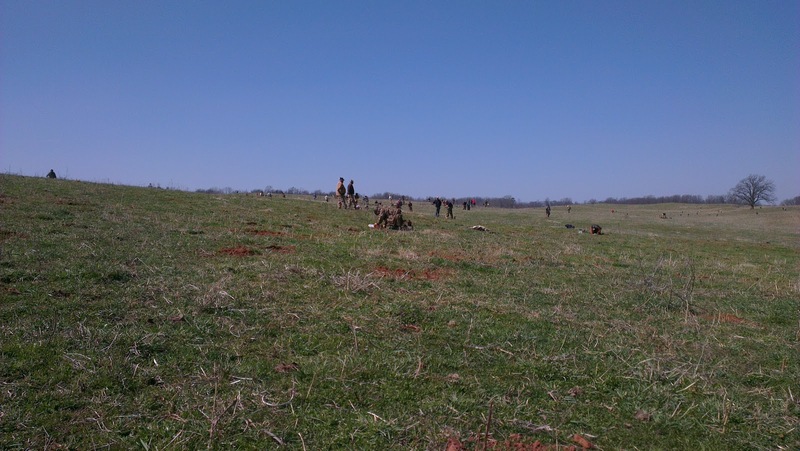 On my very first DIV at Cole's Hill, I learned the hard way that hot Virginia soil conditions don't favor VLF metal detectors in general and the Minelab E-Trac in particular. Now, don't get me wrong, the E-Trac is an amazing metal detector and I loved mine dearly — I think it has the best audio and the best meter identification system of any machine on the market. But the E-Trac cannot be manually ground-balanced and this fact alone makes it all but useless in the Culpeper area. I learned that lesson the hard way at my first DIV when another attendee who was using a PI machine noted my lack of success and offered to let me hear a button signal that he'd just found. He'd actually already dug down to the button and, even though I could see it lying on the bottom of a 5" hole, as I passed the coil of my E-Trac directly over the button, I heard ... NOTHING. It was that utterly deflating experience that led me to invest in a pulse induction machine for my next DIV. Fast forward to DIV XXIII and who should I encounter but this same helpful individual. We had a laugh about the E-Trac experience and talked about how we each had been doing so far that day. 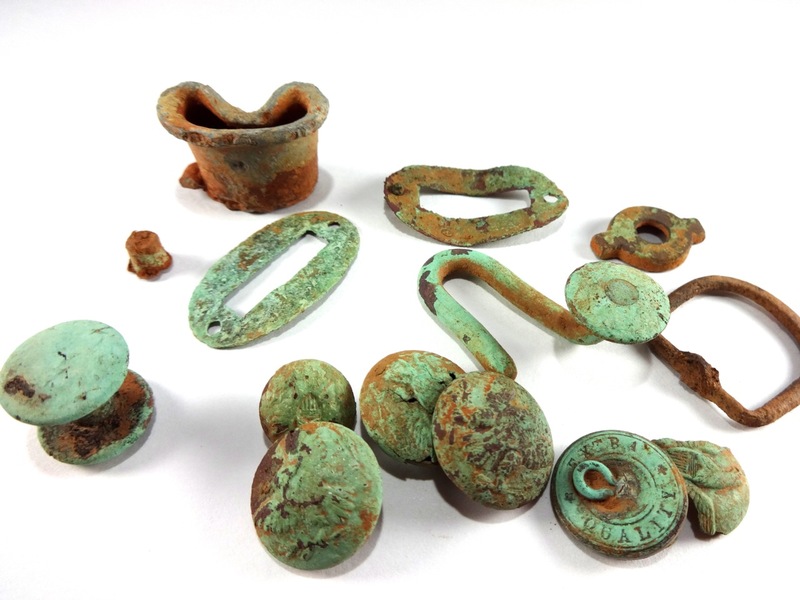 Even though we both were using Minelab GPX detectors, I had been fortunate enough to find a few more relics so he asked to compare the settings I was using. And lo and behold, I had configured my machine "incorrectly." Rather than using the settings that everyone else advocated and which I fully intended to use myself, I had accidentally chosen a different mode. I thanked my friend for helping me "once again" at DIV, returned the settings to the accepted mode, and we both got back to hunting. And here's the thing: I found almost nothing else the rest of the day! Did I accidentally discover a new GPX mode? I was unmistakably more successful (we're talking orders of magnitude) with my unconventional settings. Only time and more testing will tell but I'm working on an article and hope to post it "soon" to share my results. I'll recount one more personal anecdote from DIV XXIII and then let the relics speak for themselves. On day 2 of the hunt, I had been detecting for about 30 minutes when I started to experience the telltale signs of an incipient migraine headache. Classic migraine is something I've dealt with since I was 12 and for anyone who has experienced one, you know how completely debilitating they can be. And about the only thing worse than being nauseous and having your head feel like it's going to explode is to have a pulse induction metal detector screaming in your headphones at the same time. I hadn't had a migraine in years and tried to ignore it but I realized with a pang that if I didn't deal with the migraine I wouldn't be able to continue. At that demoralizing moment, I saw a DIV staffer approaching on a gator utility vehicle. I waved him down and he drove over to me and I saw it was none other than the DIV organizer, John Kendrick. John looks like a Civil War officer come to life and when he speaks, you hear the Old South in his Virginia accented speech. Frankly, his demeanor is a bit intimidating but in fact he's one of the nicest gentlemen you're likely to meet. I explained to him that I needed to find CSA DOC who year after year volunteers his medical services at DIV. John asked me what was wrong and I explained in a nutshell and off he road. A few minutes later, he brought three white pills, checked with DOC to make sure there weren't any allergy issues, and proffered them to me. Thirty-five minutes later, I was back in the saddle with no migraine thanks to John Kendrick and CSA DOC who I was able to thank later in person at Buffalo Wild Wings. Incidentally, I recommend you NOT go to BWW in Culpeper on a Saturday night unless you like your Karaoke really, really loud. Thanks again to John and Rose Kendrick for organizing and inviting me to the most exceptional, well-organized relic hunt in the world. There really is nothing else like DIV and I'm honored to be part of the DIV "family." Thanks to Dwight and Glenn for the camaraderie, transportation, and for not wanting to actually get up and sing at BWW karaoke night. 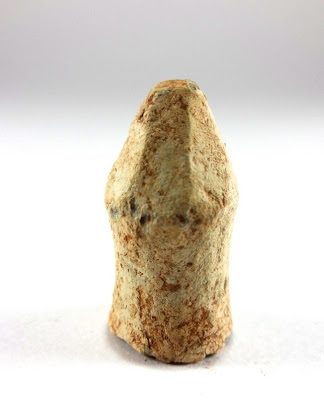 Thanks to Dan Frezza for his encyclopedic knowledge of relics and for always having time to answer a question or eight. And thanks to those long departed soldiers who fought and sacrificed for their beliefs and who unknowingly left behind vestiges of their lives and the bygone days of war. Canteen spout, McClellan saddle hardware, sword belt rivet, eagle buttons, J-Hook, gun screw bolt, etc.